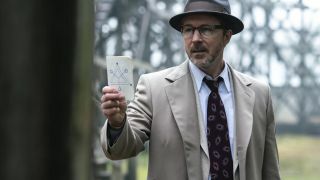 After joining Project Blue Book, Dr. J. Allen Hynek (Aiden Gillen) is drawn deeper into the mysterious world of UFOs. Unidentified flying objects (UFOs) have long inspired curiosity and speculation, but when did our fascination with UFOs really take off? A new television drama explores the origins of the UFO phenomenon, drawing from the incredible true story of the U.S. government’s decades-long investigation of reported UFO encounters.